Smoky beers are pretty unusual these days. However before 1700 or so they would have been much more common. So what changed? It’s all to do with the malt and how it’s dried. The smoke aroma comes from the wood used to kiln the malt. Before the invention of direct-fire kilns all malt would either have been smoky or air-dried. Once maltsters worked out how to dry the malt in a smoke-free manner most of them never looked back. The production of smoked malts remains a speciality in the Franconia region of Northern Bavaria, particularly around Bamberg. Wood, usually Beech, is used to fire the kilns and imparts a distinctive aroma and flavour. Beers are brewed using differing ratios of smoked to unsmoked malt to achieve the desired effect. So what’s it like when you first smell a smoked beer? It’s weird. Unsettling. Offputting even. There’s a meaty, umami quality. It can be reminiscent of ham, frankfurters, or bacon. It can also be woody, or rarely almost greasy. There will be little or no hop aroma. Not sold? Don’t give up! Be brave and go for the sip and you will most likely find that the smokiness recedes and allows other notes to come through. Expect a clean, lager character with no fruity esters, diacetyl or DMS. As your palate grows accustomed to these beers they will taste better and better, and there’s nothing else quite like them. 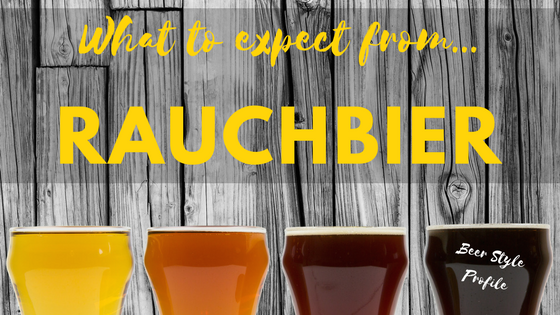 Rauchbier comes in a variety of styles, the most commonly seen being a Märzen, but also look out for helles, bock, weizen and lichtenhainer. Image by Chris Devers used under a Creative Commons licence.